I use many spinnerbait techniques and can't tell you how many times I've cast a spinnerbait and had my fishing partner of the day express dismay that I would even think of using it. You know, the water is too clear, too smooth, too deep, too cold yadda, yadda. These are the guys who might throw one for ten or fifteen minutes under what they consider "optimal" conditions and if they fail to get a strike quickly revert back to their old standby, usually some form of plastic. They sell themselves short by doing this. Most bass fishermen believe that spinnerbaits are lures effective only in spring in stained, discolored, windblown water. It's true spinnerbaits are good in these conditions. But they're capable of catching bass year round in most any condition. Success depends on spinnerbait selection as to size, blade styles, blade combinations and color. This is determined by season, water condition and depth of the bass. Once you've settled on which one to use, deciding on which of the spinnerbaits techniques to use, how you fish them, becomes no small part of the "success equation" either. I've often heard spinnerbaits described as "idiot proof". All you need do is cast it out and reel it in. It's as easy as that I'm told. Yep, you might well catch a bass or two with this retrieve but if you will open your mind a bit you can greatly increase the size and quantity of bass you catch. - cast it out and winding it back at a moderate rate. - retrieving the bait just under the water's surface such that a "wake or bulge is created by the lure as it's retrieved. - creating a slow turn of the blades while being retrieved at a very slow rate. - allowing your bait to drop to the bottom and then "ripping" it upwards a few feet off the bottom and letting it drop again. - retrieving a spinnerbait slowly along the bottom with a "lift-and-drop" action. guiding your bait so it runs into and deflects off of a stump to draw reflex strikes. - imparting a lift-and-drop action to the bait by quickly lifting your rod tip while simultaneously stopping your retrieve every 5 or 6 winds of you reel then allowing it to drop towards the bottom before repeating the process. 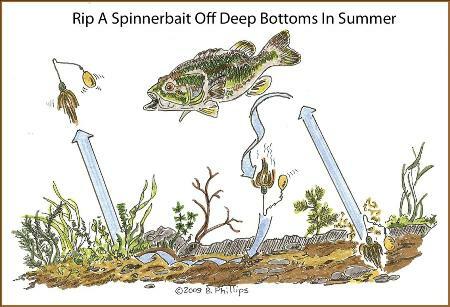 The most common of all spinnerbait techniques because it's what most of us learn when we begin fishing. Cast the lure and reel it back with a speed that will keep the bait just under the water from 1' to 5' deep. You will catch bass with this retrieve but it's at its best when you're using a spinnerbait as a "search lure" for bass and you're wanting to cover as much water as you can. It's also a good way to target suspended bass. I find using spinnerbaits of moderate weight, such as a 3/8oz or 1/2oz size, with a combination white or white/chartreuse skirt, to be good choices for this. I use one with a small No. 2 or 3 Colorado front blade and a No. 4 1/2 or 5 willow-leaf rear blade. The front blade is usually gold color and the rear silver, though they may sometimes be reversed, gold and silver respectively. I will sometimes use a single willow-leaf blade as it creates less lift and if the water is stained I'll switch to a single, gold Oklahoma blade. When "searching" for bass simply cast out, let it drop a few feet and begin your retrieve. Alternate between a moderate speed and fast retrieve taking care to periodically drop or raise your rod tip so the lure either flares its skirts or jumps slightly. These erratic actions often trigger strikes. After you catch a bass or two in an area switch to a size, blade and color "combination" that better suits the conditions in which you found them. When you see shad being chased on the surface by bass, in the Fall for example, cast past the target area then begin your retrieve. Maintain a speed that keeps the lure "just at the surface" creating a "wake" for a short distance. Then stop your retrieve allowing the bait to drop down a few feet before again resuming your wake retrieve. For this spinnerbait technique I'll use a 1/4oz or 3/8 oz, tandem willow-leaf blade spinnerbait. Others I know prefer small heads with multiple willow-leaf blades if the water is clear. A good example is the Booyah 3/8oz Super Shad™ or the 3/16oz Mini Shad™ shown at right. Some guys add a "small" split-shot to the lower wire just in front of the head of smaller spinnerbaits in order to have better control in open water situations. This increases the weight without increasing the body size. Not the easiest of spinnerbait techniques but one of the best and most effective ways to reach those bigger, wiser and older lunkers that hang deeper than 10'. Larger bass are wise and somewhat lazy. They won't generally chase a bait very far. A spinnerbait that moseys into its strike zone will appear an easy meal. The key here is maintaining contact with the bottom. Make your cast, allow it to sink to the bottom then begin your slow retrieve. You must "feel" your spinnerbait along the bottom. As you bump structure or cover "stop" and feel the bait over the rock, stump, limb or whatever you've contacted. Then resume your retrieve. If you want to use a small size bait (smaller than 3/8oz for example) deep in order to maintain a small profile, then you can add split or rubber core shot to the wire just forward of the head. This will help get the smaller bait down and make it a bit easier to keep it there. Note that doing this will likely get you more strikes from smaller bass as the smaller "meal" will have greater appeal to them and the big girls might not think it's worth the effort. Just the opposite of slow-rolling, as you might expect, and easy to learn. The key is using spinnerbaits that are heavy, just as when slow-rolling deep water, but not less than 3/4 ounce in weight and preferably heavier. The difference between these spinnerbait techniques is quite simply, the rate of retrieve. Make a long cast and allow your bait to drop all the way to the bottom. Once there, snap your rod tip quickly upward, which should pull the bait off the bottom and start the blades turning. Start reeling and reel fast. You'll most likely bump cover and structure so to avoid hanging up or continually digging into the bottom hold your rod tip high (at about a 45°-50°, not straight up) and reel faster. When "fast rolling" you'll likely get more strikes by smaller bass. The big hawgs won't often chase the fast moving bait as will the smaller ones. You never know though. If it comes close enough to a "big one", bam! It's best to use a heavy rig for this. A 7' to 7 1/2' heavy action rod, even a flipping stick, matched with 20lb test is good for this. It can be a strain working this technique all day on other than heavy gear. One of the spinnerbait techniques best done in the summertime when the bass are holding deep at 20-30'. It's one of the many vertical spinnerbait techniques that are outside the norm of horizontal retrieves for spinnerbaits. You'll need a 3/4oz head with a "single" No. 4 1/2 willow-leaf blade on heavy line. A 20lb monofilament or fluorocarbon line will work. So how is this retrieve done differently from other spinnerbait techniques? Make as long a cast as possible letting your bait drop to the bottom. Point your rod tip at the lure and crank as fast as you can for 6-8 revolutions then "stop" and let it drop back to the bottom. As soon as you detect you've hit bottom rapidly reel as before. Do this all the way back to the boat. It's important to point your rod at the lure because if you have it too high you lose the vertical distance you need to set the hook. When you rapidly reel the spinnerbait is lifted quickly off the bottom and moved upward toward the surface. When you stop reeling the bait drops back toward the bottom fluttering as it goes. This is when you will in all likelihood get most of your strikes, on the fall. This is why you want a 3/4 oz bait. If it was heavier it would drop back too quickly when what you want is a slower "flutter" fall. The greatest odds of success with this technique when bass are active and are found on long sloping points, over submerged islands, humps and in creek beds. Spinnerbait techniques also include fishing the lure like a plastic bait on the bottom. Yea, I know it sounds weird, but it can be very effective. I have to admit, I've not done well with this technique but I know some guys that do great with it. After you bait lands on the bottom take up your slack and lift your rod tip from the 9:00 to the 12:00 position. Drop your rod tip, reel up the slack and repeat the 9:00 to 12:OO retrieve keeping tension on the line. Good luck. 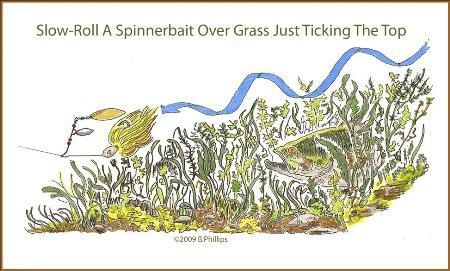 Spinnerbait techniques include using spinnerbaits like jigs in open areas of grass beds. This can be very effective. Drop your bait in one of these openings by casting past it then quickly pulling it across the grass canopy to the opening (this avoids starling the bass), let it drop to the bottom, then jig it up a couple of feet and let it drop. Bass hanging under the canopy will often take notice. Ever Do the Wave At a Football Game? Slow-rolling spinnerbaits over submerged grass can be one of the most effective spinnerbait techniques. There is an important requirement however. That is that the bait must "tick" the top of the grass. It's not that easy to do I'm afraid. Experienced anglers get quite good at it. They can feel when the lure gets "too close" to the grass and avoid having it fall into the tangle of grass branches by merely raising their rod tip while continuing to reel slowly. For less experienced anglers, well, it's in the grass they often go where they must then pull their lure loose. This commotion can prove quite disruptive to the bass hiding there. If you're successful at not "dropping in the grass" and stay above it add the smooth undulating movement of a wave in your retrieve. Achieve this by calmly raising and lowering your rod tip, only slightly, while retrieving and try to tick the top of the grass with each dip. 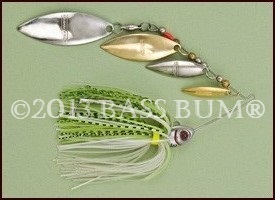 Here are a couple of suggested choices of spinnerbait combinations for this. One is 1/2 oz head with a tandem Colorado/willow-leaf blades. Put a No.3 Colorado up front and a No, 4 willow-leaf trailing it. As for color, you will rarely go wrong with white and chartreuse skirts with a gold Colorado and a silver willow-leaf. A second is a 3/4 oz head with tandem willow-leaf blades for deeper grass. If the grass is shallow, 2-3', go with a 1/4 oz head. Remember "edges"? Bass love edges. The edge of a grass bed is just that, an edge. It's a green wall with cuts, points and openings where bass hold. Retrieve a spinnerbait parallel along the wall with an understated "stop-n-go" retrieve. This will cause the skirt to flair and there is a good chance a bass will rush from hiding to crush your bait. In many reservoirs in the south the shorelines are rocky slopes, which descend like stair steps into deep water exceeding 20'. One of the best spinnerbait techniques here is to cast perpendicular to the these banks and then slowly "walk" your bait, like a Slinky down the stairs, from one ledge to another. Let the spinnerbait fall off the edge of one rock shelf and "helicopter' to the next being sure to let out line as it goes, otherwise the lure will swing back toward you and away from bass holding on these ledges. The strikes will often come just after the bait drops over the edge of a shelf. Add slow-rolling a spinnerbait along the trunk of a laydown tree to your list of spinnerbait techniques. It's a prime place to run a spinnerbait, especially if the tree has lost most of its many secondary branches and only the primary ones remain. Best tactic, cast to the shallow end next to the bank and within 2-3" of the trunk Then, holding your rod tip high, begin your slow-roll retrieve lowering the tip as the bait moves the length of the tree toward you. Try and keep the bait no more than 4" deep during the retrieve and make sure to bump the branches as you come. If there are numerous small, medium and large branches remaining on the tree remove your trailer hook. Remember, the end of the laydown extending away from shore may well be floating or resting over 10', 20' or more water. Furthermore, the tree provides shade along its full length which bass will use as a path from shallow to deep water. Cast and retrieve your spinnerbait past and perpendicular to the end. Retrieve it toward the end just under the surface and stop it at the end allowing it to drop. Brace yourself. Best size for this technique is arguably a 3/8oz with a single No.4 to No.6 Colorado blade. This is a classic among spinnerbait techniques. Since spinnerbaits are very much "contact" lures it's usually a good thing to bump them into anything you can while retrieving them. But stumps, especially shallow (3-5'), isolated stumps are primo. Bass will hold close to such stumps, even in contact with them if there are exposed roots. One way to fish a stump is to cast past the stump and "wake" the bait guiding it so it bumps into the stump. When contact is made "drop" the bait so it falls down the side of the stump. Alternatively, instead of bumping the stump, guide it so it passes exactly along side the stump. What size spinnerbait for this? A 1/4 oz is good. Match it with tandem willow-leaf blades. If the water is heavily stained switch to a single Colorado. 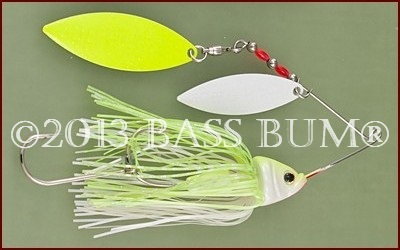 A spinnerbait is really a jig with blades. One of the spinnerbait techniques you can use around submerged timber is to fish it just like a jig. Take a 1/2oz head with a No.4 nickel or gold blade and cast it along side a tree then let it drop vertically beside the trunk to the bottom. Once there, lift it up 3-4' then let it drop again. Make sure you watch your line and if it twitches or moves to the side reel down and set the hook. Repeat this several times. Unexpectedly, this technique, like many spinnerbait techniques, works well when the sky is clear and sunny. So Many Spinnerbait Techniques Make Spinnerbaits One Of The Most Versatile Lures. Do Yourself A Favor - Learn To Use It.